Treatment sessions at Restoring Performance are crafted around the needs and desires of our clients and can include a mix of sports massage, soft-tissue work, pain and injury treatment, and movement work. Sessions can also be combined with other specialties – including movement and performance assessments for a powerful combination designed to eliminate pain and unravel limitations. There are times that we need to bring in additional help and different perspectives and are always happy to work hand in hand with other members of your performance team – whether that is with your doctor, PT, chiropractor, or coach. One thing I've always been impressed with from the first time I saw Mark, is how much he understands and grasps about the body and bodywork. As an athlete himself, so he's seen much of what comes through the door and understands how to address your issues with confidence, skill, and effectiveness. I wanted to let you know how good I feel. I can feel the differences in strength and how strong my body feels again! My body is re-adjusting.. But it feels so good. Thank you for everything you do. I have to tell you how grateful I am for your good work. I'm so sorry I waited so long to come see you. Never again! I feel like I have my life back in. I did yoga and walking yesterday and my ankle is better than ever. Thank you so much! When you simply need to flush the body to coax out the effects of that last hard training block and restore tissue health, a combination of gentle but firm deep tissue work is ideal to bring the body back into balance and give your nervous system some much needed down time and care. Sessions might include any combination of massage, deep tissue, sports massage, Active Release Technique (ART), or Integrated Cranial work and are designed to speed the healing process along as best as possible. Sessions can integrate movement work and use Dynamic Neuromuscular Assessment (D.N.A. ), Neurokinetic Therapy (NKT), and Proprioceptive Deep Tendon Reflex (P-DTR) to find and address the causes of the pain and movement restriction. Treatments are based on the UNWIND® Methodology developed by Mark to safely address and restore systemic function and tissue health. When addressing the muscle imbalances that might be creating pain and dysfunctional movement we can use a variety of modalities including deep tissue massage, sports massage, Active Release Technique (ART), and Integrated Cranial work to treat and restore function, movement, and tissue health for an effective and long-lasting treatment. *note that Rock Tape application will include an additional charge. Dynamic Neuromuscular Assessment (D.N.A.) is an assessment strategy that uses five essential skills to challenge and test movement patterns in clients and identify the priority issues that may be causing inappropriate movement compensations, pain, and or injury. Developed by Joseph Schwartz as a culmination of his past 30 years of bodywork experience and knowledge, D.N.A. provides a fast and intuitive method for working with clients, athletes, and movers. Curious to find out more? Join Joseph and I for the next clinic or schedule a session at Restoring Performance. A schedule of upcoming clinics can be found at Movement Mantra. Neurokinetic Therapy, or NKT, is an assessment and corrective bodywork modality that allows the practitioner to find and treat the causes of pain and dysfunction in the body. It is based on using a system of precise muscle tests and the feedback of the neurological system via the motor control center (MCC) of the brain. By challenging the body through different movement patterns we can determine if the nervous system can respond appropriately for the job asked of it. When it is unable we have the opportunity to find the relationships and teach the nervous system how to use a more advantageous movement pattern. At Restoring Performance we will often integrate NKT with other treatment modalities, such as Active Release Therapy (A.R.T. ), deep tissue, cranial sacral, and movement work to optimize the therapeutic process and long-term benefit for our clients. Proprioceptive Deep Tendon Reflex, or P-DTR, allows a practitioner to address musculoskeletal problems by focusing on an important, but largely overlooked apparatus of the human body: the proprioceptive neurologic system. Developed by Dr. Palomar, P-DTR works to reset sensory proprioceptors and pathways that have been blocked or improperly integrated due to conflictive information, such as the result of a trauma or injury. By providing the brain with an opportunity to recognize a better solution, we can effect a quick and non-intrusive change to the tissues as a result of the neurological patterns driving them. Thus the therapeutic focus has changed from trying to do something to the body structures to integrating an appropriate neurologic response. Think of the proprioceptive system as the 'software' and the bones, muscles, ligaments, and tendons as the 'hardware'. For clients who continue to have pain or movement limitations when the structure has healed after surgery or rehab, P-DTR provides the tools to assess if the pain, or movement limitation, is actually a nervous system response to a trauma or injury, or if it is the result of structural issues. As a treatment modality, P-DTR allows us to effectively correct and treat the underlying neurological patterns at the root of the pain or movement pattern. Once the pattern is resolved, we can integrate any other modality for a far deeper and effective level of bodywork. This can include Active Release Technique (A.R.T. ), tissue work, movement therapy, or cranial sacral work. Each can be easily blended with P-DTR for a very powerful treatment combination. 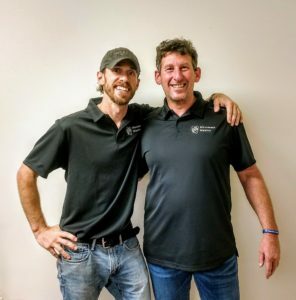 At Restoring Performance Mark Kendall is the only advanced certified practitioner (and one of only four) in the state of Texas. The UNWIND® Methodology is a treatment protocol developed by Mark Kendall to methodically address how the body has organized itself around injuries and trauma. The guiding principles are built around first creating safety and stability for the nervous system before unwinding the layers of compensations, including structural, neurological, physiological, and emotional adaptations that have helped us survive and perform in the moment. By understanding the rules the brain uses to organize our structure under load we can restore systemic function and tissue health in an understood hierarchy of layers, providing a safe and gentle treatment experience. By utilizing the principles of the UNWIND® Methodology we also have the opportunity to create a customized UNWIND® Movement Program. Each program is customized to safely guide clients through restorative movement work designed to further increase their capability and capacity moving and performing. Curious? Drop me a note to find out more!